Created using the CVD (Carbon Vapour Deposition) method on the substrate. This type of graphene consists of very thin sheets of very high quality. 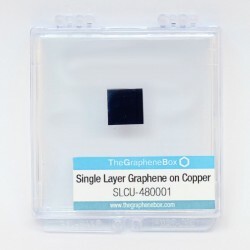 Due to their purity, these samples exhibit the highest conductivity within The Graphene Box range of products, which are usually intended for research laboratories and R&D departments that develop applications such as touchscreens, smart windows, flexible OLEDs, LCDs and solar panels. Graphene on substrate There is 1 product. Single layer of graphene grown on copper, the graphene grows on both sides of the copper foil. This is a very homogeneous and high quality product.